Thoughts on what to say about this ice cream have been swirling through my brain but really, nothing I come up with is doing it justice. 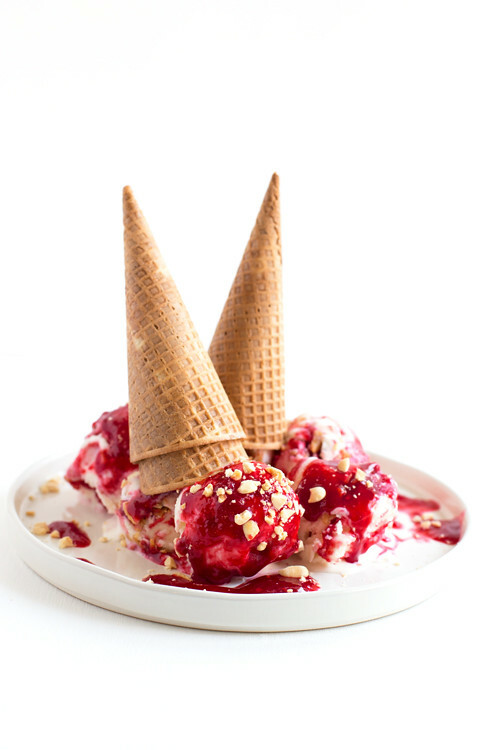 I mean, it’s all the flavors of the much beloved PB&J in an ice cream: squishy white bread, tart jam, and wonderful peanut butter (team crunchy!). Peanut butter and jelly–though it’s always jam in my house, preferably raspberry–are childhood lunch memories sandwiched between two slices of bread. I have no doubt my love of this iconic sandwich has to do with the fact that as a child nothing felt more exciting than indulging my sweet tooth and a pb&j was basically a free pass to do exactly that and call it lunch. I’ve steeped toasted Hokkaido Milk Bread (made from this genius recipe) in the milk–this bread is an Asian-style soft and lightly sweet pillow of a bread that is basically heaven on its own. Even though my choice of pb&j sandwiches would have untoasted bread, the bread here is toasted for maximum flavor. The milk gets turned into the ice cream base making this toast ice cream. Yes. 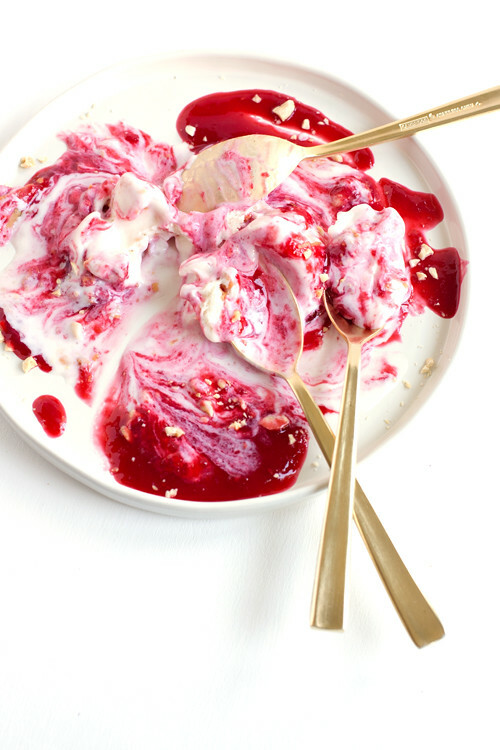 Then it gets swirled with a fresh raspberry ripple–fresh, juicy raspberries and sugar–and a just snappy peanut butter ripple which gives the whole deal a little texture. 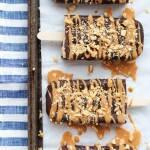 I can’t even with these pictures–they’re making me wish we still had a pint left in the freezer, but that’s a total pipe dream because we devoured it, obvs. 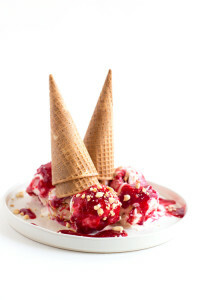 Toast flavored ice cream with peanut butter and raspberry ripples! For the toast portion of the recipe, I like an enriched white bread–I used leftovers from a batch of Hokkaido Milk Bread–challah, brioche, or Hawaiian bread would all be great, as well. Be sure to toast the bread to a deep golden brown without burning it. The deeper toast makes for a more pronounced toast flavor in the ice cream. This recipe may have a lot of steps, but broken up over a day or two makes something totally worth the effort! Preheat the oven to 350ºF. Spread the bread cubes onto a baking sheet and bake in the oven for 15-20 minutes, stirring every 5-10 minutes, until the bread cubes are deeply toasted. Remove from the oven and cool slightly. Place 2 cups of the whole milk (reserve the additional cup for later) into a saucepan and heat to scalding (until small bubbles form around the edges of the milk). Add the toasted bread, stir, remove from the heat, and cover. Allow the milk and toast to sit for about 15 minutes. Meanwhile, in a large bowl whisk the cream cheese and salt together. Set aside. In another bowl, whisk together the cornstarch with about 2 tablespoons of the reserved 1 cup of milk to make a slurry. Pour the milk soaked bread into a fine mesh sieve fit over a bowl and press out the liquid–you should yield about 1 cup of toast flavored milk. Discard the soaked toast. Add the remaining cup of milk (you may need more or less) to the toast flavored milk to yield a total of 2 cups. Add this milk back to the saucepan and with the cream, sugar and corn syrup. Heat the mixture over medium-high heat and bring to a simmer, quickly whisk in the cornstarch-milk slurry and bring to a boil. Boil for 4 minutes and remove from the heat. 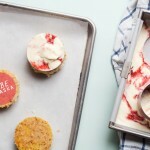 Whisk the mixture into the cream cheese mixture and either place into a gallon sized, zip-top bag and cool in an ice bath, or cover the top with plastic wrap–touching the surface of the ice cream base–and chill in the refrigerator for several hours or overnight. While the ice cream base chills, make the ripples. 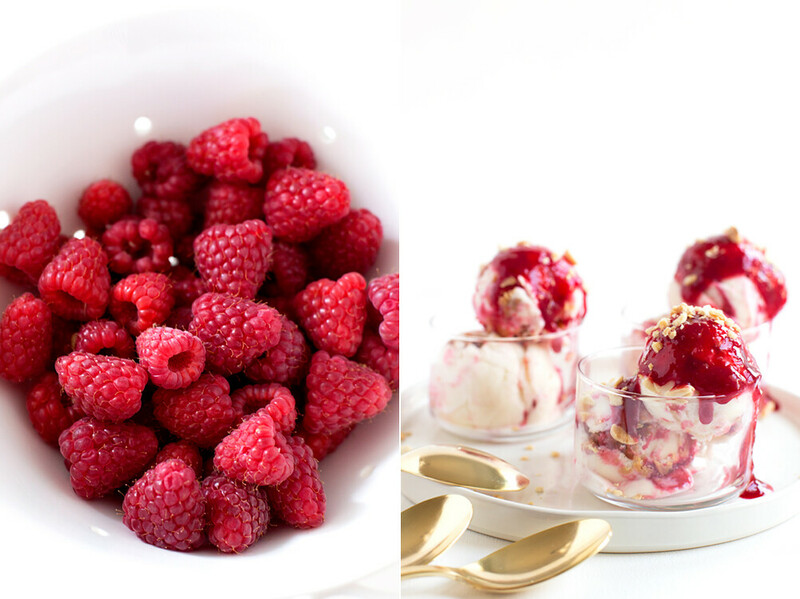 For the raspberry ripple, place the berries and sugar into a saucepan and bring to a boil. Cook until the berries break down and the sugar is dissolved, stirring frequently–about 5 minutes. 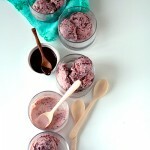 Press the raspberry mixture through a sieve to remove the seeds and set aside to cool–can be done a day in advance and stored in a lidded container in the refrigerator. For the peanut butter ripple, melt the peanut butter and coconut oil together in a heat safe bowl in the microwave for about 30 seconds. Remove from the microwave and stir until smooth. Once the ice cream base has chilled, process in an ice cream maker according to the manufacturers instructions. Layer ⅓ of the ice cream base into a freezer container with some of the raspberry ripple and peanut butter ripple, repeat with the remaining ice cream base, raspberry ripple, and peanut butter ripple–you may have extra ripple, just refrigerate and use to top the ice cream later (the peanut butter ripple will need a quick turn (30-60seconds) in the microwave). Cover with a lid and freeze for several hours until the ice cream is firm. Sounds like a dream! I love pb&j anything, girl. Definitely trying this! YES! Thanks, Cynthia. I love that bread, your recipe is so great! Omg, this looks amazing. 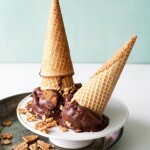 I love the way you’ve styled the shot with the cones. It looks delightful! Thanks, Michelle! I think those cones look like legs, ha! 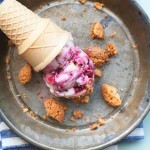 Beautiful photography and the ice cream looks delish! I gotta give this a try. Thanks so much! This looks SO good, Cindy! I happen to have half a loaf of Hokkaido milk bread (danger!) which I’m sure takes this to the next level. Oh my GAWDDDDD. BREAD in ice cream??!! Kinda freaking out over this right now. As a kid I hated PB&J but then I grew up and developed a sweet tooth and discovered the wonders. This looks absolutely amazing and love the pics. Man… pregnant people without ice cream in the house should NOT read this post. There should be a warning. HOLY COW. Looks so amazing. I must have this. Also, my house it is nearly always raspberry jam as well! 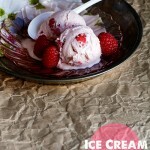 Aah this ice cream looks amazing! SUCH delicious shots. Pinned! Looks amazing! Beautiful pictures! Pinned!